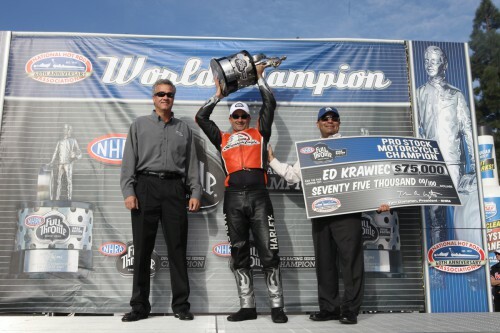 Harley-Davidson Screamin’ Eagle/Vance & Hines rider Ed Krawiec is the 2011 NHRA Pro Stock Motorcycle world champion. Krawiec clinched the title with a second-round win at the Automobile Club of Southern California NHRA Finals at Auto Club Raceway that eliminated Lucas Oil Buell rider Hector Arana Jr., the only rider in the field with a chance to overtake Krawiec for the championship. 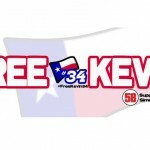 Krawiec advanced to the final round and lost to his Harley-Davidson Screamin’ Eagle/Vance & Hines teammate Andrew Hines, who finished the season third in points. Krawiec’s championship is the fifth for the Harley-Davidson Screamin’ Eagle/Vance & Hines team. Hines won the title three years in a row from 2004 through 2006, and Krawiec earned his first championship in 2008. Krawiec won four times during the 2011 season, at Gainesville, Norwalk, Charlotte, and Las Vegas. 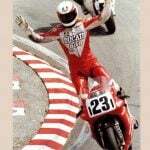 He also set a new Pro Stock Motorcycle speed record of 199.26 mph at Gainesville. 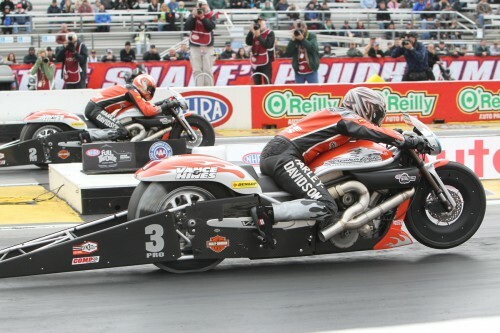 The Harley-Davidson Screamin’ Eagle/Vance & Hines team dominated the Pro Stock Motorcycle field at the NHRA Finals. Hines was the top qualifier, riding his Harley-Davidson® V-Rod® to a 6.820-second elapsed time (ET) in the first run on Thursday. Arana Jr. qualified second at 6.832 seconds, while Krawiec qualified a V-Rod® third at 6.850 seconds. 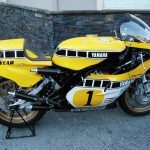 Krawiec began Sunday eliminations with a 69-point lead over Arana Jr., and opened with a win over Geico Suzuki rider Karen Stoffer. 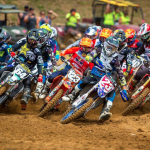 Arana Jr. kept pace by defeating Next Level Racing Suzuki rider Justin Finely. Krawiec ended the title suspense in round two by defeating the 2010 champion, Nitrofish Suzuki rider LE Tonglet. Krawiec then put an exclamation point on the day by defeating Arana Jr. in the semi-final round. Hines blasted through Sunday eliminations with wins over Michael Phillips on The Edge Suzuki, Buell rider Angie Smith, and Lucas Oil Buell rider Hector Arana Sr., setting up an all-Harley final-round match with Krawiec. Hines got the win when Krawiec fouled at the starting line. It was the second win of the season for Hines, who also won the final at Houston. The final Pro Stock Motorcycle points tally has Krawiec in first place with 2,691 points. Arana Jr. is second with 2601 points, followed by Hines with 2,511 points, Matt Smith with 2,456 points, and Arana Sr. in fifth place with 2389 points.